A reliable Wi-Fi network and BYOD culture go hand in hand. Over the last ten years Wi-Fi has become a more relevant aspect of our everyday working practices. Within the working culture of 2017, employees are more inclined to stay connected to the internet from a mobile device all day, which means that they’re never tied down to a desktop computer when they’re using their device at work. As a result of this, workplaces have become more flexible than ever before – and employees are now able to work in a more defined, and personal way because of the online technologies they are able to access anywhere in the workplace. A wireless internet connection has meant that employees can now cope with rapid changes from day to day quickly, are less dictated by timescales – and can adhere to tasks as and when they need to. Business Wi-Fi providers KBR have explored the ways in which smart device internet connectivity have helped transform the workplace into a more fast-paced, increasingly efficient space where workers feel a greater sense of autonomy every day; here, we discuss their findings. BYOD (bring your own device) is a new workplace trend that is becoming more popular as internet connectivity becomes more widely available. What this means is that employees are allowed to bring their own smart device, i.e. a mobile-phone, tablet or laptop and use this as part of their working practice when connected to the workplace’s Wi-Fi network. When used correctly, BYOD culture can help boost workplace connectivity if they are connected wirelessly to an online source. Through their ability to be connected at all times anywhere within the workspace, employees are able to work on – and complete tasks in ways that they haven’t been able to before. One example of this, is that workers can respond to emails on their way to a meeting, outside of the office, or during a meeting when it is appropriate to do so. What this does is fill dead-time within the working day that wasn’t utilised before, for example, when the employee isn’t stationed at their computer. According to the Cisco Internet Business Solutions Group, research suggests that ‘the average BYOD user across countries saves 37 minutes per week thanks to using their own device.’ Furthermore, it was found that users in America saved a total of 81 minutes during the working week, and Germany saved four minutes per week. Even though some countries are making more of an efficiency saving than others, the global picture within the West appears apparent: when a Wi-Fi network is combined with a mobile device, workers can save time and improve efficiency within the working day by decreasing dead-time. When comparing work completed outside of work before and after BYOD was introduced, the connected employee is working an extra two hours every day and is also sending 20 more emails, which is impressive when we consider that workers probably aren’t realising this because of the convenience of completing a carried over task at home. Although, the important thing to consider is that this increase in productivity does come at a cost. 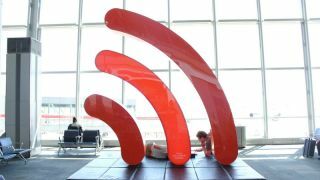 As most employees are connected to the businesses Wi-Fi network, companies are having to spend more money than ever before on security measures that ensure both employees and businesses are protected from hackers and malware that attempts to breach Wi-Fi networks. What many businesses are concerned about, is whether a connected workplace to Wi-Fi servers is a distraction when using smart devices in the workplace. However, this question is not, and was never going to be, as straightforward as corporations would have liked it to be. Although workers are spending more time checking their own personal devices and social media, employees are also using their increased connectivity to complete working tasks whenever they can. The benefit of this is that if employees experience a problem within their personal life, they can remain at work for a longer period of time if they are able to remain in contact with whoever involved in that situation. Employers need employees who are going to remain at work as long as they need them to be, so if an employee is connected, work can still be done and they don’t need to leave the office to deal with a situation. For every $10,000 USD worth of salary, disengaged employees account for a $3,400 cost to their employer. What this means, is that if a UK employee started on a salary of £16,376 in the UK, this would cost an employer £5,569 in disengagement costs. However, research has suggested that the way to negate these costs in through a smart device and Wi-Fi connection. Surveying 1,865 employees, a study conducted by the Economist Intelligence Unit found that those connected to an internet server from a mobile device created a 16% boost in productivity for the business, relating to an 18% boost in the creativity of employees when they are at work. Over a 40-hour week, employees contributing a 16% boost to productivity makes up an accrued total of an extra 6.4 hours per week, which means an employer can make a total efficiency saving of 41 working days in a year. Not only did workplace efficiency increase, but job satisfaction also increased by 23%, and company loyalty by 21%. What this is down to, is that employees may feel more empowered when they can use their smart-device, and they are made to feel more autonomous within their working practices and they can work independently throughout the day. When it comes to increased levels of productivity, businesses who adopt a BYOD culture with an interconnected Wi-Fi policy are able to make the most efficiency savings. Increasing the independence of workers across the globe, it is no surprise that BYOD culture has been introduced throughout Western markets. When employers want to get the most out of their employees, trusting them with a Wi-Fi network and mobile device is the best route to take.